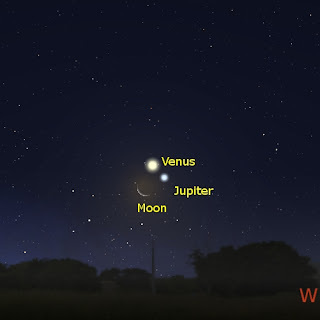 Counting down to the Venus, Jupiter and Moon lineup Tomorrow. After a clear, beautiful, cloudless day, with much frolicking in pools and on beaches, the clouds came over just on sunset. Typical (see blog subtitle), luckily there was a brief hole in the cloud and I was able to get this shot off before the cloud closed over (even then, Venus is partly obscured by cloud, it's the left hand object and should be much brighter than Jupiter (as always, click to enlarge). Here's hoping tomorrow night is clear, when the tow planets and the Moon are so close they can be covered by your thumb. Venus and Jupiter, view from the washing up. Venus and Jupiter shine through the window as I do the washing up (as always, click on the image to enlarge). They are visibly closer than the last time I posted, well on the way to the spectacular line up on Monday night of Venus, Jupiter and the Moon. As I've said before, you can see a great deal from the window over the sink. You get a skyshow and clean up at the same time. Carnival of Space #81 is here. Carnival of space #81 is now up at Tiny Mantras. There is space books for Kids, tips on buying a telescope, what happens when advertising meets astronomy, drinking coffee in space, Martian Glaciers and much, much more. Mooch over now and have a read! ... I have held the Iron Chef's bound, completed thesis in my hands. Other copies are now reding in the Graduate Centre for distribution to the Library, as of mid December the Iron Chef gets a floppy hat and Gown and can now call himself Dr. Iron Chef. Iron Chef was my first "supervise all by myself" PhD student. He has been working with me for 5 years (1 year honours, 4 years PhD) and it will be strange to not have him as a student any more. However, I will still get to see him a lot, his post doc is with my collaborator the Footy Man, and so he'll be in my lab half the time anyway. Congratulations Dr. Iron Chef! Now I just have to read Poisons first chapter throughly, and he can get on his way to being Dr. Poision. Smallest One went to school today. He doesn't go to school for real until next year, but over the next two weeks his kind group get to spend a day at the school the will go to next year. He was really excited about going (and its the same school his brother go to). The Bettdeckererschnappender weisle made him piklets for morning tea, and he got dress in Middle Ones old uniform. He had a lovely time, andwas really well behaved, but he was sooooo tired when he got home. Couldn't even tempt him with Pizza, he just fell asleep. Venus and Jupiter glow in the evening, just before being engulfed by cloud. GAHHHH, hopefully the night of the lineup will be clear. A Leonid Storm in 2009? Following the successful prediction of a peak in Leonid activity this year, what does 2009 hold for us in the way of Leonids? Jeremie Vaubaillon suggests that there will be a peak with a ZHR of 500 on 17/11/2009 at 21:43 UT (that's around 9 am on 18/11/2009 in eastern Australia, sob), Mikhail Maslov predicts a series of close peaks around 22 UT on 17/11/2009 with a combined ZHR of around 150. So maybe something very good, maybe something just good. The nights will dark with no interference from the moon. Very worth a look. Despite the peaks occuring in daytime for mostAustralia, we shoul see some increased activity, and folks in WA might see quite increased rates. 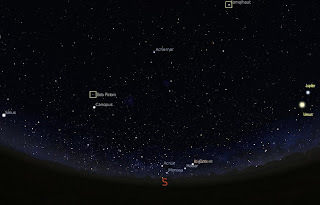 The south-western sky as seen from the Southern hemipshere around 9:30 pm local time (you will need to click on the image to see the chart properly). Where are the stars with exoplanets? Well, all over really. There is almost no direction that you can look in without you gaze falling on an area that has a star that has an exoplanet around it. True, most of these stars are too faint to see with the unaided eye, or just on the threshold of visibility. However, two of the three exoplanetary systems that have been observed visually recently are quite bright, and can be easily observed with the unaided eye from the southern hemisphere (sorry northern hemisphere folks, we've got the brightest galaxies and globular clusters too). Fomalhaut is magnitude 1.3, and beta Pictoris is magnitude 3.9, making them easily visible under suburban skies, you don't have to trek into the bush to see them. Fomalhaut is the easiest to spot at the moment. 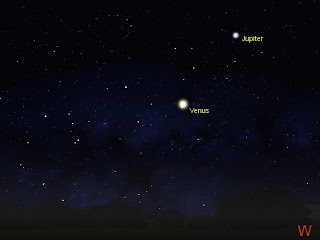 At around 9:30 pm, look west, take a moment to appreciate Venus and Jupiter, then raise your gaze towards the zenith. The first reasonably bright star you see near the zenith is Fomalhaut, home to a Jupiter sized world orbiting far out. Beta Pictoris is a little harder to pick up, but only a little. Looking to the South west you will see a very bright yellowish star, this is Canopus, the dimmer star just above and slightly to the left of Canopus is Beta Pictoris. So, the next fine night, while you are looking at the antics of Venus and Jupiter, take time to have a look at these stars, and tell your friends or kids that alien worlds orbit them. Venus, Jupiter and the Moon: An Awesome Lineup Coming Up. I hope you have all been enjoying the antics of Jupiter and Venus in Sagittarius. This week sees a spectacular finale as Venus and Jupiter come together for an amazing lineup in the sky. At the moment, Venus is easily seen high in the early western evening sky near the handle of the "teapot" of Sagittarius, not far from Jupiter (the brightest object in the sky after Venus). As the week goes on, Venus and Jupiter come much, much closer together. By Saturday 29 November they are nearly side by side. On the 30th they draw closer again, and the thin crescent Moon can be seen below them almost touching the bright star Kaus Borealis in the lid of the "Teapot". Finally, on Monday December 1 the crescent Moon, Venus and Jupiter form a close triangle that you can cover with your thumb. All three objects will fit into the field of view of a pair of binoculars. A small telescope will show the craters of the Moon, the satellites of Jupiter and the half moon phase of Venus all close by. 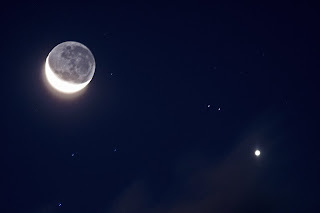 The dark side of the Moon should show up with the ghostly glow of Earthshine on it. This will be an excellent photo opportunity. The best time to look is between half an hour and an hour and a half after sunset, although the planets can be seen outside these times. What Happened to the Leonids? As I was off conferencing in Storm City at the time of the Leonids, I had no chance to see how they went. Australian observers don't seem to have seen much, but the predicted mini outburst was seen by people in Europe (the one that occurred in daylight for us in Australia. Here's a nice fireball image from the Leonids (the Moon is the big round object), and here is a composite image of the Leonids over 4 days. Apart form anything elese our modeling of meteor shpowers is getting better. A planet around beta Pictoris? We have long suspected that the star Beta Pictoris had at least one planet, due to distortions in its dust disk. But now it appears to have been imaged directly. Tom has the image and a good description, as does Centauri Dreams, as well as a nice table of directly imaged exoplanet candidates and a diagram of their distances from their stars. We have 9 systems where we have directly imaged possible exoplanets (with 2 systems confiremed), that's pretty amazing. I've just come back from the Australian Health and Medical Research Congress. Being in the middle of exam time, this was a quick fly-in-flyout thing (sorry John), then I spent the bulk of the weekend marking exams. But I did get to experience the storms that hit Brisbane (see more pictures here), Adelaide storms are very wimpy things, and I hadn't had a good storm for a long time. The Wednesday storm came right over Mum's house, and it was fantastic to smell the approaching rain, and watch the lightning arc across the sky. At one stage Mum came out and I thought she was going to ask me to come in, but she said "Turn the lights on son, that way you can see the hail better". Naturally I got no photos of the storm, or of the Venus - Sagittarius conjunction (because of all the lcoud, of course), so here are some photos I took when the family walked downm to the Kiosk for fish and chips. At least its a starfish, and the wired patters the drifting sand made over the hard san were pretty amazing. Carnival of Space #80 is here. Carnival of Space #80 is now live at Starts with a Bang. It's a Thanksgiving themed edition, there are oenas on Mars, cosmonaut reunions, the 10th birthday of the International Space Station and much much more. Pick up your eating irons and get ready to tuck in. I love my camera. The image on the right is of the false comet in Scoropius taken at ISO 800, the one on the left is the false comet, ISO 800, taken in the suburbs. I have to play with the settings more, but it looks like I can really push things wiith this camera. Smallest One is a prime number old. His borthera are all odd numvbers old as well, bout only Eldest One is a prime number as well, although Middle One's age is a cube of a prime number. Added together, the sum of all three boys ages is the square of Smallest Ones age. For the Birthday, I did a chemistry magic show with pH indicators and dry ice. Warning, if you try this, small children ill try and eat/drink the most toxic thing in your kit. Exoplanets you can actually SEE! Image Credit: W.M. Keck Observatory. Well, provided you have a REALLY enormous telescope to hand. If you have been living under a rock, then you probably don't know that the Hubble Telescope has produced visible light images of a Jupiter-sized planet planet that circles the the Star Fomalhaut, and the the Gemini and Keck observatories have have imaged a planetary system around a fairly ordinary star, HR 8799 in Pegasus. 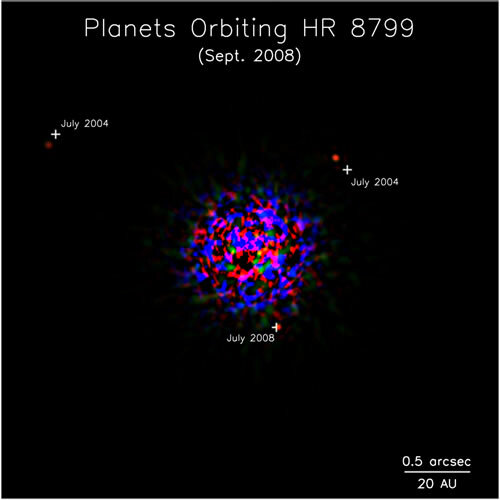 Normally planets around other stars are found by measuring the tiny wobbles in their parent star that the planets orbits produce, or measuring the tiny dips in light when a plants moves in front of its star, or more rarey by graviational lensing. There are the first, actual images of planets. They are fuzzy dots to be sure, but these dots are alien worlds. Just think of that. Fomalhaut is special to me, as it is easily visible from my back yard, one of the bright southern stars that have accompanied my various stellar adventures. In fact, that Fomalhaut has planets is pretty amazing, given that most planest have been found around stars that are either too dim to see or just visible to the unaided eye (like HR899 in Pegasus, finder charts here). But you don't want me wittering on about all this, there is a great post over at the Planetary Society by Amir Alexander, Systemic has some interesting musings, Tom has some choice words and Stuart also has a good take on this. And Stuarts name for Fomalhaut b is Sauron, that is the most appropriate planet name ever, We need to lobby the IAU for it to be adopted. 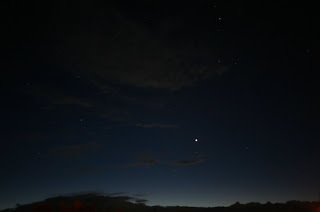 The Moon is close to Venus in the lovely shot from Tony Tavaglia of Otago, New Zealand. This was shot with a 400mm lens Canon. Beautiful as awlays, click on the image to enlarge. The north-eastern horizon in Australia at around 4 am local daylight saving time on Tuesday 18 November (click to enlarge). 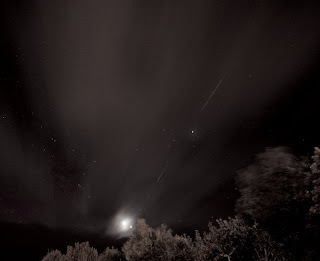 Given that the Taurids were really nice, what's happening with the Leonid meteor shower? Well, I more-or-less answered this back in in August. While there is a prediction for a short outburst of possibly 100-150 meteors per hour, the peak falls on around 11:30 am Eastern Daylight savings time on the 18th, well after the sun has risen. A second prediction puts the peak at 10:00 am EDST, again well after the sun has risen. Ther is another possible peak on the 19th, which alos occurs during daylight in the eastern stares, but might be picked up in Western Australia. 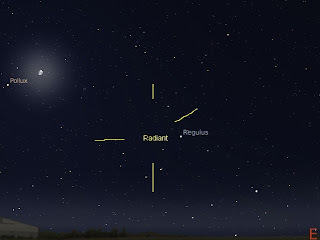 As well, the waning Moon is close to the radaint, making it hard to observe meteors. So maybe it may be a good idea to sleep in on Tuesday morning. On the other hand, if the peaks arrive early, we might see something nice. The western horizon in Australian at roughly 9:30 pm local daylight saving time, 18th November (click to enlarge chart). Venus is next to the Lagoon Nebula tonight, unfortunately, it is also behind thick cloud (see subtitle of blog). Still over the next few days Venus has some interesting encounters. On November 17 and 18 (Monday and Tuesday) Venus forms a very bright "lid" to the teapot of Sagittarius, in the process coming very close to the bright star Kaus Australis. On the 19th and 20th of November (Wednesday and Thursday) Venus will be near the globular cluster M22. This is best seen in binoculars though (or in very dark sky sites). All the time Venus and Jupiter are coming closer, for a spectacular rendezvous in December. Remember Bernhard Häusler's cool images 0f C/2008 T2 Cardinal? Well, he's done a great animation of it near IC 512 (needs recent quicktime version). For those of you following the Taurid meteor shower, and want more pictures than are available here, go to the Taurid Gallery at Realclearwx (also great storm photos). Hat tip to anonymous in the Taurid Thread. C2008 T2 is a quite dim comet making its first pass through the inner solar system. Bernhard Häusler managed to snap it as it passed by IC512 and some other faint galaxies. He got it again a few days later. Venus, the Moon and the ISS. Another stunning image from Tony Travaglia of Otago, New Zealand. Here he has captures the International Space Station passing Jupiter, Venus and the Moon. This was taken with his 10-22mm lens at 10mm, about 80 sec exposure ISO 250. Tony wasn't happy with the cloud coming over, but I think it lends dramatic atmosphere to the scene. As always, click on the image to enlarge it. On October 7 infrasound detectors in Kenya registered the presence of an explosion over Africa, at the same time a weather satellite registered a flash of light. These were the last moments of Asteroid 2008 TC3, the first asteroid to have been predicted to impact earth (okay the asteroid was only about 2 meters in diameter, but impressive none the less). Emily Lakdawalla gives a good overview of this event at The Planetary Society, and Astronomy Post of the Day has an image of the persistent train left after the asteroid burnt up. A week ago today I was out in the bush at a family wedding. In between chatting to folks I hadn't seen in ages, listening to music, hanging out with the kids, and eating a lot, I got to see some fantastic stars. I also got to see Venus snuggle up to the Moon. A truly beautiful sight, and I got to point it out to quite a few kids and adults as we sheltered from the cold, howling wind (luckily the post wedding events were inside an historic farmhouse with really thick walls, but every so often people went outside to smoke, clear heads, run around screaming etc.). Sadly I didn't have my proper tripod with me (would have helped during the wedding photography too). These images were taken with the camera on one of those tiny portable tripods about the size of you hand, balanced on an old bench. Didn't come out too badly if I say so myself. As usual, click on the images to enlarge them. In the enlarged image of the bottom photo, you can see Antares and the head of the Scorpion. Aminoacyl-tRNA synthetase ribozyme, an example of the RNA-based catalysts that may have preceded protein enzymmes during the origin of life. The Museum of Science at Boston has a fantastic interactive web resource on the origins of life. Exploring Lifes Origins has a timeline of lifes evolution (with sliders), and pages on understanding the RNA world and building protocells, with a nice animation of protocell replication. 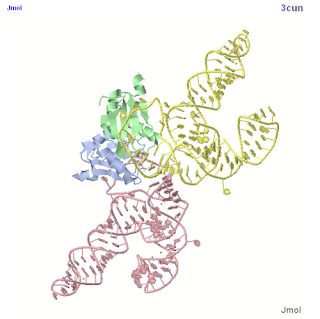 The pages have been made in collaboration with ribozyme guru Jack Szostak and his laboratory, and there is a handy resources page for educators. If you are interested in our current understanding of the origin of life, this is a very handy starting off point. You can explore ribozymes in more detail with proteopedia. Carnival of Space #78 is here. Carnival of Space #78 is now up at Simostronomy (Hi Mike!). There's a fairground of magnetic fields, ballon rides to the edge of space, the last days of the Phoenix lander, commercial space flight, reaching out to the stars and much, much more. Why not get a ticket and saunter in? Cloud (see blog subtitle), more cloud. In reports from the rest of Australia, there appear to be very few Taurids showing up (roughly 1 every 20 minutres), but they are very bright with persistent trains. 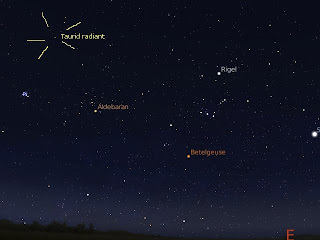 The peak of the Taurids is very broad, so if you are out and about around midnight in th enext night or so, have a look. Spaceweather has a nice Taurid image and some explanation. The Eastern horizon as seen from Australia at midnight, Wednesday November 5. Tonight (Wednesday 5th November) , is the peak of the Taurid Meteor shower. The Taurids are linked to debris from comet 2P/Enke, and roughly every 3 years there is an outburst as Earths orbit intersects the debris cloud. This year Earth brushes the edges of the cloud, and it is possible that there may be heightened meteor activity. As the Taurids are relatively weak, this mean that we could possibly see one meteor every 5 minutes of so (rather than one every 15 minutes). Carnival of Space #77 is here. Carnival of Space #77 is now up at Tomorrow is Here. A post-Halloween edition, there is spooky skies of Halloween, live aurora webcams, melting asteroids on Mars, the last days of Phoenix and lots lots more. Shimmy on over and have a read. (Yes, I know it went live 4 days ago, but I've been involved in secret family business again). Another very nice image from Tony Travaglia. This is a fairly old image of Venus under the head of the Scorpion (Antares is near the top left of the image). You will need to click on the inage and enlarge it for best effect. This was taken with an Image Source camera. Tony (an Cynthia earlier) sent me his images a while ago, but I'm only just putting them up now as I'm slack (oh yeah, and family duties keeping me a thousand or so Km away from my computer). Remember the Partial Lunar Eclipse of August 17? Well, reader Cynthia Ma has sent in some images of her experience. I particularly like this one. The photo was taken were taken in Hornsby NSW with a "mere DC Casio Exili" as Cynthia says.